We use our phones frequently, our phones are important because our lives revolve around them. We get messages, calls, we socialize with the use of our phones and get a lot done by virtue of the presence of our phones too. So, it'll understandably be frustrating if for one reason or the other we can't use our phones when we need them. A lot of things could be responsible for you getting locked out of your phone. It doesn't matter how you got locked out, what matters is that you are locked out and can't get in. "Find My iPhone" was introduced by Apple in iOS 5, devices like iPhone 4, iPhone 4s, iPhone 3GS, iPad 2, 3rd generation iPads and 3rd and 4th generation iPods were the first to incorporate the feature. It helps to track and locate lost phones using iCloud. It includes Activation Lock which makes it impossible for anyone else to ever use your iDevice if it's ever lost or stolen. It's automatically enabled when you turn on "Find My iPhone". Part 2: What Can I Do If Verification Failed When I Turn off "Find My iPhone"
"Find My iPhone" disables the restoration of your iPhone when you attempt to do that in the event that you forgot your passcode. It prevents you from privacy being stolen as it presumes you are a thief who's trying to make a lost iPhone their own. It renders all efforts to use the phone without the passcode useless, which can leave you in a bit of a pickle. 1 However, there are steps you can take in these situations. To switch off the "Find My iPhone" option, touch the Settings icon on your phone, then touch your account. It usually has your name, then you touch iCloud, then you scroll down till you find the "Find My iPhone" toggle and then deselect it. 2 You can also turn it off by turning off iCloud on your device. Remotely turn it off if your screen is bad or your battery is flat/bad by going to iCloud.com. On arrival at the website, input your Apple ID, click Find iPhone, click All Devices and proceed to Select Your iPhone from the list of devices connected to the account, then click Remove From Account. This only works if you have the passcode as you need it to log into your Apple account. But note that, either with which way, you need to enter the Apple ID password to proceed. 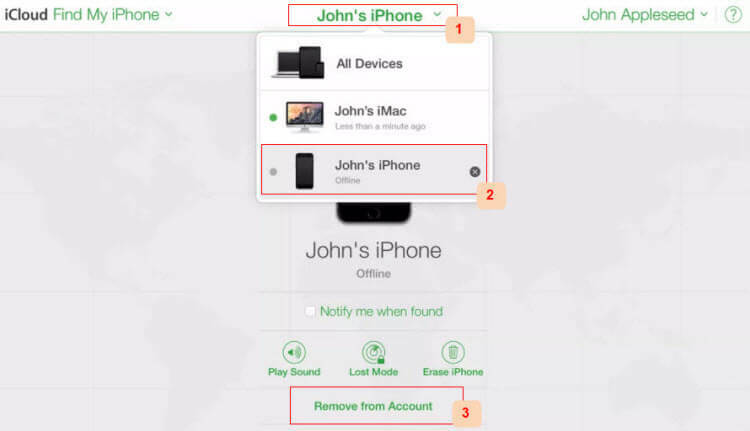 What Can I Do If Verification Failed When I Turn off "Find My iPhone"
If while trying to turn off "Find My iPhone" you experience difficulties and it keeps telling you Verification Failed after a few tries, then I should check the network on the device. In general, “Verification Failed” issue is due to poor network connection. If your iOS 12 device is connected to cellular data, you can change it to Wi-Fi for trial. The answer is No. An unequivocal No. Turning on the "Find My iPhone" option means your phone becomes inaccessible without the passcode. No one without the passcode can get to your phone and access your private information. A few people try to use Factory Reset mode, which can't even reset your data to be irrecoverable. It never works. It only succeeds in frustrating your efforts. There is great news for you if you have encountered these problems I spoke about previously. 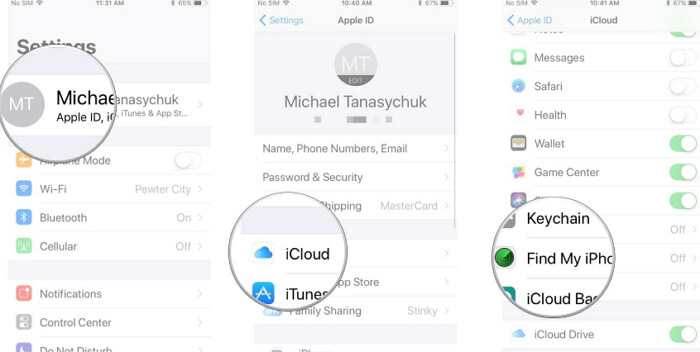 There is a platform that can bypass the Activation Lock that "Find My iPhone" works with. iMyFone Umate Pro for Win or for Mac is a platform that was created with these sort of problem in mind. I'll give you a run down on its capabilities now. It erases iOS with 0% recovery possibility. It deletes messages, contacts, call history, photos and videos, browsing data, etc. Whatever it be, iMyFone Umate Pro deletes it totally. 100% Wipe of third party apps like WhatsApp, WeChat, Kik, Viber, and a lot more. 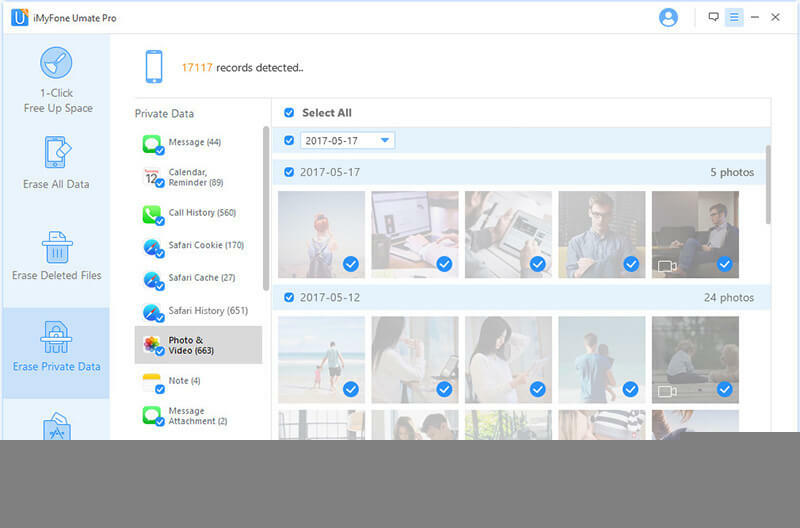 Secures the privacy of your data by completely and permanently deleting it when formatting your phone. iOS optimisation by clearing up space while simultaneously improving the speed of your device. It is an immensely helpful package. In addition to these key features, it erases the private fragments that third party apps store. Leaving no chance for the compromise of your privacy. Incomplete leftovers of data are completely cleaned up and made inaccessible forever. Note: Keep in mind that, to completely reset or erase your iOS 12 device, you need to make sure “Find My iPhone” is disabled first. Step 1: Download, install and launch iMyFone Umate Pro and connect your iOS 12 device. Step 2: Choose Erase mode and then click “Erase” or “Scan” button. Erase All Data: If you want a full erasure of the whole device, choose it. Erase Deleted Files: Select this mode if you need to make sure all the previously deleted files are completely gone. 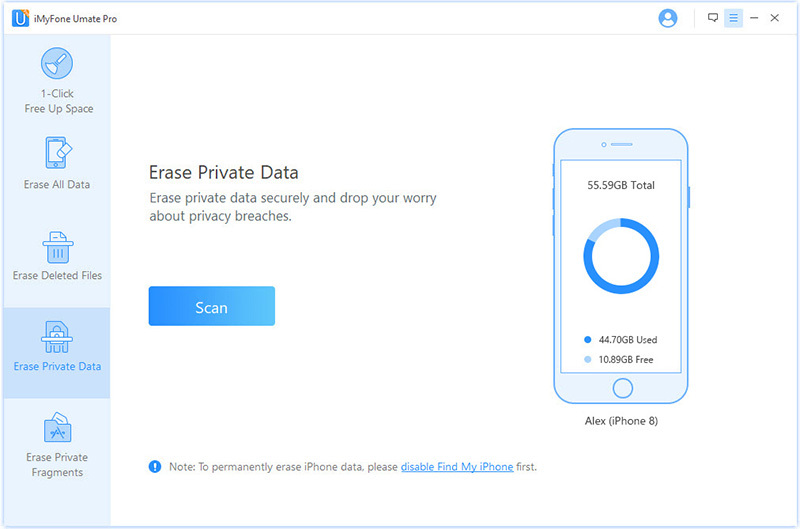 Erase Private Data: This mode allows you to preview the existing data on device and select unwanted private data to erase. Erase Private Fragments: It will show you the private traces left by third-party apps and you can check to fully wipe. Step 3: Preview and select data. Then hit “Erase Now” button to continue. Step 4: After typing “delete” into the box and choosing the Security Level, click “Erase Now” to proceed. There you have it, the steps to bypassing the Activation Lock that "Find My iPhone" uses. You should be able to use your iPhone after it boots.